The movie GI Joe 3: trailer, clips, photos, soundtrack, news and much more! GI Joe 2 Retaliation did rather well in theaters: the film already grossed more than $365 million worldwide for a production budget at $130 million hence making a hefty profit. And it’s a franchise with a huge appeal. So I guess you aren’t surprised to hear that Paramount Pictures and MGM are planning a third movie. There’s going to be a GI Joe 3 movie indeed. Director John M. Chu who helmed GI Joe 2 will be back to helm the new installment. The plot hasn’t been revealed yet. Actually, the studios haven’t even hired a scriptwriter yet. But for sure Cobra Cobra Commander will be once again scheming to dominate the world and Actor Dwayne Johnson, Ray Park and Byung-hun Lee will likely reprise their roles. There’s word of the Baroness (played by Sienna Miller in the first film) coming back for GI joe 3. Would Actress Sienna Miller reprise her role? Now that Storm Shadow is at odds with Cobra, will he join Snake Eyes and the GI Joes? 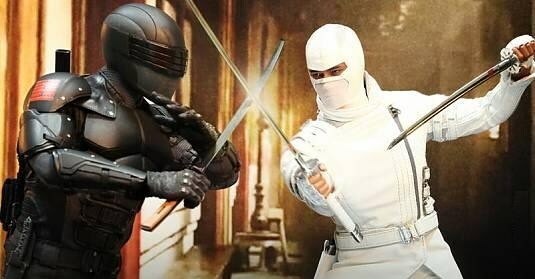 Snake Eyes and Storm Shadow would make a hell of a great team! Anyway, do you have any suggestion regarding the plot of GI Joe 3? Share your thoughts below! Stay tuned with us for more details about the movie GI Joe 3!